Many times when studying the Bible people get to a point where they just cannot make sense of the passage in question. With the proper hermeneutical skills, many such difficulties could be solved. Admittedly, skill in the area of hermeneutics is not gained in a week or a month. It takes time and dedication. It takes hours and hours of thinking and rethinking. In order to do honest hermeneutics it may become necessary to throw out preconceived ideas, until such ideas are confirmed by the proper study of God’s Word. And, such study is not achieved by a superficial glimpse into the riches of God’s Word. Once artificial study of God’s Word becomes a habit, one will almost never get to the point where Biblical knowledge becomes part of who we are. The study of God’s Word is not to become clever, but to live in truth and to have changed lives. Our aim in interpreting the Bible is not to be unique and different to everybody else. In fact, chances are good that the unique interpretation is wrong. The aim of the interpreter is to get to the plain meaning of the text. In the end, the litmus test of good interpretation is that it makes good sense of the text at hand. The Bible is at the same time human and divine. The Bible was given to us in the words of the people of history. The Bible is not written outside the scope of history or the context of that history. This alone suggests to us that some interpretation will be needed to understand the Bible. However, since God was the One who spoke through these writers, and the Bible is His Word to us, it certainly has eternal relevance. The best tool still for good interpretation is a good translation of the Bible. The translation you choose will determine how much truth you will receive in your study of God’s Word. However, no matter how good a translation is, it was still influenced by the translation skill of the translators who are not flawless in their work. It is good to use mainly one good translation for one’s study, but use it in conjunction with several other well-chosen translations. Currently, my main study Bible is the NASB. I then use it in conjunction with the ESV, HCSB, NIV, ISV and the RSV. Every now and again I will also consult a free translation such as the J.B. Phillips New Testament. Translation from one language to another certainly is a science. Many things need to be considered before translation work can begin. Translators must make sure that the Hebrew/Aramaic and Greek texts are as close as possible to the original. However, no original copies exist. There are thousands of copies or fragments that exist (5000+ for the New Testament alone). It is a painstaking process to go through all these copies and fragments to come to the point of having a text as close as could be expected to the original. To study more about this subject one can read Biblical Criticism: Historical, Literary and Textual by Harrison, Waltke, Guthrie and Fee, Zondervan Publishing House, Grand Rapids, Michigan, 1986; and The Text of the New Testament Its Transmission, Corruption, and Restoration, Third Enlarged Edition, Bruce M. Metzger, Oxford University Press, New York, NY, 1992. This painstaking process is known as textual criticism. First, textual criticism is carefully guided by scientific controls. The evidence for a text is guided by two controls. (a) External evidence is controlled by the age and quality of a given text or variant. (b) Internal evidence has to do with the authors and the copyists of variants. External evidence, combined with internal evidence, give us a high degree of certainty concerning the original text. Second, textual criticism is not an exact science since it deals with a multitude of human variables. This can be seen on translation committees when different translators disagree on which textual variant to use. Words and ideas need to be transferred from one language to another. In this case from the Biblical languages to English. Translation from one language to another needs to think of several factors. First, we have the source language. This is the language or languages of the Bible. They are Hebrew and Aramaic for the Old Testament and Greek for the New Testament. Second, we have the destination or receptor language. In our case it is English. Third, there exists an historical distance between the source and destination languages (words, grammar, idioms, culture, history). Gordon Fee feels that the basic translation one should have for reading is a dynamic equivalence translation such as the NIV.4 He writes that a literal translation keeps distance at the wrong places, that is, in language and grammar. He also feels that a literal translation makes the English ambiguous where the Hebrew and Greek were clear to the original recipients. As an example, to show that the dynamic equivalence theory is not necessarily the best, we will look at Rom 3:25. The quotes from the different translations below are ordered from most literal to least literal. whom God displayed publicly as a propitiation in His blood through faith. whom God put forward as an expiation by his blood, to be received by faith. whom God offered as a place where atonement by Christ's blood could occur through faith. God presented him as a sacrifice of atonement, through faith in his blood. God offered him, so that by his sacrificial death he should become the means by which people's sins are forgiven through their faith in him. God sacrificed Jesus on the altar of the world to clear that world of sin. Having faith in him sets us in the clear. For God sent Christ Jesus to take the punishment for our sins and to end all God’s anger against us. He used Christ’s blood and our faith as the means of saving us from His wrath. If we look at the word propitiation in regards to the one translation that Fee suggests should be one’s primary translation—the NIV—we have to conclude that “sacrifice of atonement” is perhaps not such a good translation after all! Who today—even within the modern church—will understand that phrase in relation to Biblical theology anyhow? If we are teaching our people to do proper Bible study and base that on solid doctrinal teaching, then the word “propitiation” will have a wealth of meaning for them. Do not get me wrong, the NIV is a good translation, but I believe that the closer to the originals one can get—without having to sift through theological bias in a translation—the better. The more a translator deviates from the original, the more his opinion dominates in interpretive matters. In the study of the Bible, there are many tools that can help us discover the meanings of the text. However, we do not always have all these tools at our disposal. Biblical texts – this will provide the Biblical text for closer study of the originals. Biblical grammars – grammars will help in learning the languages of the Bible. Lexicons – this will help in finding the proper meaning of words in the original. Concordances – helps finding every appearance of a word in the Bible. 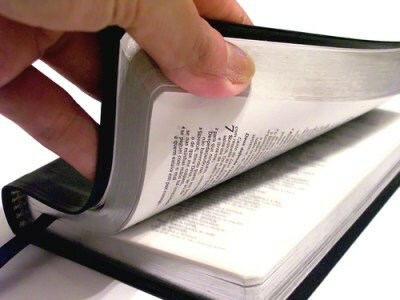 Bible Dictionaries and encyclopaedias – helps in finding words and names found in the Bible with descriptions about them. Biblical introduction – good Biblical background. Commentaries – will help see what the great men of the past and present have thought concerning a passage. Church history – knowledge of church history will help us in not making the same mistakes as those in the past. It will also assist us in learning about the struggles of the past in terms of the church and its theology. First, the interpreter must be born again. Second, the interpreter must have a passion to know God’s word. One cannot love God without wanting to know more about God and His word to us. This comes only from the Scriptures. The Bible is our only rule for faith and practice. Third, the interpreter must have a deep reverence for God. If we do not fear the Lord, we will not bother with wanting to know His will and ways for our lives. We will not change! Fourth, the interpreter must depend on the Holy Spirit to guide and direct. The Holy Spirit inspired the Scriptures. He knows best. However, the Holy Spirit will never be as crystal clear as the original inspiration of the Scriptures. Many have claimed that the Holy Spirit has given them interpretations and words; yet, they differed greatly from others who have claimed the same. There is confusion between inspiration and illumination. The inspiration of the Scriptures is infallible. Illumination of the Scriptures is not. No man today can claim infallible illumination of the Scriptures. If we do not regard the Bible as authoritative, we will not let it dictate our beliefs or our lifestyle. The first law of interpretation informs us that the Bible is our final court of appeal. This authority is shown in several ways: First, a Biblical character acts in a certain way and the passage in question shows whether this action was approved or disapproved. Second, the same as in the first point, but no indication is given as to whether this action was approved or disapproved. In this case the rest of the Bible must be used to indicate whether such an action is approved or disapproved of. Third, God or someone who represents Him—priest, prophet, apostle—reveals the mind and will of God. The whole of the Bible interprets the part. Whenever obscure passages are encountered they must give way to clear passages. Context is very important. Any verse or passage has a context to consider. A verse or passage cannot stand by itself, but should be considered by its context which would include the rest of the chapter, book, testament it is found in, historical and cultural background. Even today we do not speak or write within a vacuum. When studying the Bible, do not add or subtract from it. We need to do proper exegesis—letting the Bible speak for itself—rather than eisegesis—enforcing our thoughts and ideas onto the Bible. Eisegesis would be like putting words in God’s mouth. Many of today’s Christians would rather interpret Scripture in light of their experience. This would be like “barking” like a dog or “hissing” like a snake and calling that acts of God, but totally disregarding how the Bible uses the words “dogs” and “snakes” and what it says about them. A good example would be when Abraham gave a tenth of his spoils to Melchizedek. In this case, nowhere in the text did God command Abraham to give a tenth to anyone. In fact, we are never told anywhere in Scripture that Abraham ever did this again, nor that he made it a “principle” in his life from that point on. Yet, many want to use this event to show that tithing is a timeless principle! When it comes to examples, we must first differentiate between that which the Bible simply records and that which it approves of. Simply because something is recorded in the Bible does not mean that we have to follow suit. Second, we may apply those incidents the Bible directly condemns or approves. Third, commands directly to individuals are not God’s will for us, but for them alone. Fourth, determine what the principle is in the lives of the characters in the Bible. We need to take care in our uses of promises in the Bible as follows: First, ascertain whether the promise is a personal promise to a person in the Bible. Promises like these may not apply to us today. Second, is this promise conditional? One thing must be fulfilled before another will become true. Third, is this promise universal in extent. Does it apply to everybody? Fourth, is this promise valid for today? Promises not meant for today can obviously not be claimed. We are to apply what the Bible teaches us. However, the Bible is primarily Christological and not anthropological. That is, the Bible is primarily about Christ and not man. The Bible tells us who God is and how He accomplished the redemption of His people. It is no use basing our changed lives on a God that does not exist and a work He did not do. Therefore, correct doctrine is important, for it helps us relate to the one true God and also to understand His message of redemption. In the final analysis, each one of us will one day stand before God when He hands out rewards. We cannot stand before Him and tell Him that we did not know. We cannot tell Him that someone else taught us wrong. You are responsible for your walk and doctrine before God. Although church history is important for us as Christians, it is not decisive as to the correct interpretation of the Bible. It can show us how the church got to certain doctrines and also the mistakes the church has made over the centuries. The Bible determines what the church teaches and not vice versa. An example of this follows. If God is in control of our lives, what is God’s relation to sin in this world? Does God cause the sin that people do? There are many Scriptures where it seems that God is the instigator of evil. Joseph clearly puts the blame at their feet, “you meant evil against me,” yet he acknowledges God’s dominant providential control over his life. When the Israelites wanted to leave Egypt, it is clear that God hardened Pharaoh's heart! (Ex 4:21). God did this several times (Ex 7:3; 9:12; 10:20, 27; 11:10; 14:8). Scripture also tells us that Pharaoh hardened his own heart (Ex 8:15, 32; 9:34). Many use this to speculate that God simply hardened the heart of Pharaoh in response to his own initial hardness and rebellion. However, it must be noted that we are told that God hardened the heart of Pharaoh before we are told that Pharaoh hardened his own heart. According to our doctrine of concurrence, even when God and man cause the same event, both factors can be true at once. It is not inconsistent to say that God caused Pharaoh to harden his own heart, and so God hardened his heart. God had a purpose to all this. Paul quotes this verse in Rom 9:17 and follows it with a general truth. God not only hardened the heart of Pharaoh, but also that of his people to the extent that they would follow after the Israelites into the Red Sea (Ex 14:17; Ps 105:25). Other narratives where God hardened the hearts of people can be found in the Canaanites. Samson’s decision to marry a Philistine was not his own (Ex 14:4), but came from the Lord. Why would Eli’s sons not listen to him? Saul—after his pride got the most of him—was tormented by an evil spirit … from the Lord! When David sinned, the Lord sent Nathan the prophet to him to deliver a message that will stop most of us cold in our tracks. When David called a census of the people God was angered against David’s sin (2 Sam 24:1). David recognized the fact that he sinned so he repented (2 Sam 24:10). However, the Lord gave him one of three choices that would befall him or his people: (1) Seven years of famine, (2) three months of fleeing before his enemies, or (3) three days of pestilence over his people. David chose the latter (2 Sam 24:11-16). Why did God do this in the first place? God was angry with Israel, and so incited David to sin, in order to bring that punishment on Israel. However, what was the means by which God did this inciting?. After Solomon’s sin of turning away from the Lord by taking foreign wives, God raised up evil kings against him (1 Ki 11:14, 23). Look at Job’s circumstances. The Lord gave Satan permission to bring great harm to Job’s belongings and to his family. This harm came via the evil Sabeans, the Chaldeans and even a windstorm (Job 1:12, 15, 17, 19). Even though this happened, Job saw beyond the second causes, and sees all of it as from God’s hand. In all this Job did not sin, and he did not blame God for his circumstances (Job 1:22). During the time that Jehoshaphat was king of Judah, God put a lying spirit in the mouth of the prophets of Ahab, the king of Israel (1 Ki 22:23). God also used the Assyrians as the rod of His anger to punish Israel (Is 10:5), and brought the Babylonians against Israel (Jer 25:9). Then when God finished using the Babylonians and Chaldeans in His anger against Israel, He punished those same Babylonians and Chaldeans for their wickedness (Jer 25:12). It is sometimes not comfortable for us to hear about some of the things that God does, simply because we have always been taught otherwise. Yet, when the Bible tells us that God makes peace and creates evil, we need to teach the whole counsel of God, not just half if it. The greatest evil deed ever certainly was that of the crucifixion of Jesus. Yet, it too was ordained by God. He did not just ordain the fact of its future eventuality, but also the individual actions related to it. God predestined all the actions of the participants in the crucifixion of Jesus in order to fulfil His purpose. However, the apostles never lay moral blame before God, for the evil acts of willing human beings. God, through His eternal wisdom, brought about His plan through the willing choices of men. How do you treat these passages? Do you allegorize them because they do not fit into your doctrinal framework? When studying words in the Bible it needs to be ascertained how the author used it first. Second, the word’s relation to its own context needs to be found. Third, what was the use of the word in the time of the writing? Fourth, the word’s root meaning must be ascertained. This means that words may be studied etymologically. However, this does not always help us in our search for meaning in the Bible. Fifth, words may be studied comparatively by using a Hebrew or Greek concordance to determine all occurrences of that word in the Bible. Such a comparative study could also be very useful in studying synonyms. The study of αγαπη (agape) and φιλεω (fileo), and also λογος (logos) and ρημα (rhema) will present an interesting study of synonyms. “He is bloodthirsty.” What does this mean to you? If I told you it was Idi Amin you would think that he just liked to have people killed for opposing his regime. If I told you that it was a T Rex you would think that he actually killed animals to eat them. A study of the word “world” will show that it could have several meanings depending on the context.. It could mean the physical world we call “earth.” It could also refer to this world system of thought and its evil ways. It could even mean a smaller part of earth such as the Roman Empire. Finally, it could even mean the Gentiles as opposed to the Jews. The book it comes from. The background of the time of the writing (language, culture, archaeology). These differing contexts could help solve difficult passages. The Roman Catholic Church fell into this trap when they interpreted the bread and the wine of Lk 22:19-20 as literally becoming the body and blood of Jesus when the priest blesses it. However, they never interpreted Jesus literally being a door (Jn 10:7) or bread (Jn 6:35). Inanimate objects cannot have life and action of its own. Therefore, in situations such as these, they should be interpreted figuratively. Is Paul really talking of dogs? No! Attempt at all times to interpret passages literally. However, if it will not make sense that way, then perhaps it should be interpreted figuratively. Another important point to remember is that a word cannot have more than one meaning in its context (the Amplified Bible suggests that this is a possibility). The meaning cannot be literal and figurative at the same time. The following questions can be answered by any passage: To whom? From Whom? Why? When? How? What? Historical facts may only be interpreted as symbols of spiritual truths when they have been designated in such a way by Scripture. This can be seen in the way Paul allegorises Hagar and Sarah (Gal 4:21-31). We must understand the Bible grammatically before we can understand it theologically. What does this really mean? Before we can understand what the Bible means, we need to understand what it says! The Bible is the self-revelation of God and not any system of theology. Our theology should be based on good exegesis of the Bible and not the other way round. Correct exegesis will provide us with the knowledge of the truth of God’s word. A jury in court cannot make a proper judgement unless they have heard all the arguments and have all the facts. This means that when we study any topic in the Bible we need to study all the passages related to it in the Bible. This also means that our theology should go no further than the Biblical evidence. Doctrines that “seem” to contradict one another usually solve themselves into a higher unity. This is apparent with doctrines such as the “Trinity,” the dual nature of Christ or the origin and existence of evil. The capstone of God’s revelation to man is the New Testament and the One who brought us the New Testament, Jesus Christ. The Bible is undeniably Christological and that Christology is revealed to us in the New Testament. To have a system in studying the Bible that provides us with relevant formulations of the Biblical data is not only beneficial, it is also necessary. It is necessary to build up a system in order to understand what the whole of the Bible says about a particular doctrine. This is what we call a systematic theology. It takes each individual doctrine and formulates an intelligent statement regarding each of the doctrines of the Bible. The next step would be to interrelate each of these doctrines into a congruous systematic theology. Ramm, Bernard, Protestant Biblical Interpretation, A Textbook of Hermeneutics, Baker Book House, Grand Rapids, Michigan, Thirteenth Printing, December 1982, p1. Fee, Gordon D. & Stuart, Douglas, How to Read the Bible for all its Worth: A Guide to Understanding the Bible, Zondervan Publishing House, Grand Rapids, Michigan, 1982, p34. Thomas, Robert L., How to Choose a Bible Version, Christian Focus Publications, Great Britain, 2000, p97. Walvoord, John, Jesus Christ Our Lord, Moody Press, Chicago, Illinois, Thirteenth Printing, 1982, p171. The principles of interpretation as set out in this article largely come from Henrichsen, Walter A., A Layman’s Guide to Interpreting the Bible, Zondervan Publishing House, Grand Rapids, Michigan, Fourth Printing, 1981. Henrichsen, Walter A., A Layman’s Guide to Interpreting the Bible, Zondervan Publishing House, Grand Rapids, Michigan, Fourth Printing, 1981, pp50-51.